Cheaper, faster and more precise. The joint venture between ESVAGT and Wind Power LAB reduces both weather risk and expenses related to drone inspections of offshore wind turbines. 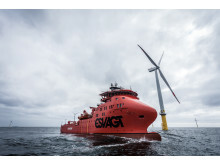 ESVAGT have joined forces with Wind Power Lab, an Artificial Intelligence and blade specialist, to offer a series of services that support the control of offshore assets and expand their lifetime, without any weather risk for the owners. The first service in the portfolio is the inspection of WTG blades.